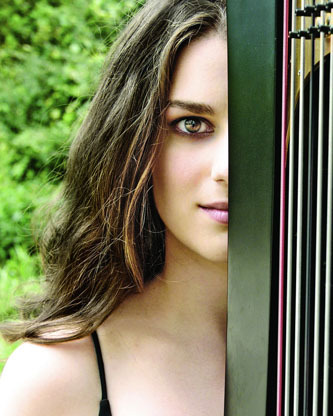 The New York Times has said harpist Bridget Kibbey "makes it seem as though her instrument had been waiting all its life to explode with the gorgeous colors and energetic figures she was getting from it," while The Washington Post has opined ". . . Kibbey's recital at the Phillips Collection on Sunday went from beauty to rarified beauty in an eclectic hour-long program. The dazzling runs, complex poly-rhythmic figures and chiming of bell-like harmonics all made their effect, thanks as much to Kibbey's formidable technique as to the canny writing of the composers and arrangers on offer…" And in Lucid Culture: "The star of this particular evening [Carnegie Hall, Classical Recording Foundation Awards] was harpist Bridget Kibbey. While the classical concert harp probably isn’t the first instrument that you would think of as being badass, Kibbey makes it that way. Praised for her DIY esthetic, she lends her unorthodox virtuosity and powerful attack to a nonstop series of new commissions… "
Lauded for her compelling artistry and virtuosity, harpist Bridget Kibbey is gaining a reputation for showcasing the broad range of her instrument through multiple-genre performances—drawing diverse audiences through new collaborations and platforms. Kibbey is a recipient of the prestigious Avery Fisher Career Grant, the Classical Recording Foundation's Young Artist Award, a 2015 Salon de Virtuosi Grant, and the only harpist to win a position with the Chamber Music Society of Lincoln Center's Chamber Music Society II, a winner of Concert Artist Guild's International Competition, Astral Artist Auditions, and Premiere Prix at the Journées de les Harpes Competition in Arles, France. She tours internationally as concerto soloist, recitalist, and collaborator with some of today's most compelling artists. Bridget's debut album, Love Is Come Again, was named one of the Top Ten Releases by Time Out New York. She was most recently featured with tenor Placido Domingo on a new album entitled Encanto del Mar, released on SONY Records this past year. She may also be heard on Deutsche Grammaphon with soprano Dawn Upshaw, in Luciano Berio's Folk Songs and Osvaldo Golijov's Ayre. Kibbey's solo performances have been broadcast on NPR's Performance Today, on New York's WQXR and Q2 Radio, WNYC's Soundcheck, WETA's Front Row Washington, WRTI’s Crossover, and A&E's Breakfast with the Arts. She is featured annually with the Chamber Music Society of Lincoln Center, is a principal artist with Camerata Pacifica in California, and has appeared as featured soloist and chamber artist at the Bravo!Vail, Chamber Music Northwest, Bridgehampton, Aspen, Bay Chamber Festivals, Pelotas, Savannah Music Festival, among others. With a passion for commissioning new repertoire for the harp, Kibbey recently spearheaded a five-orchestra concerto-commissioning consortium with Juno Award–winning composer Vivian Fung. She performed five world-premiere performances with The Karlsruhe Badische Symphoniker (Germany), The Phillips Camerata in Washington, D.C., The Alabama Symphony, The San José Chamber Orchestra, and the Metropolis Ensemble. This season's highlights include performances of Ginastera's Harp Concerto with the Alabama Symphony in honor of the composer's centennial. She will be featured as soloist with the The Chamber Music Society of Lincoln Center in Alice Tully Hall, in the Lyon and Healy Concert Series, the Ravinia Festival, the Bridgehampton Festival, the Ojai Festival, and with Camerata Pacifica. Kibbey will also be featured on Los Angeles' KCET with the San Francisco Children's Chorus and in New York City, and with the St. Thomas Boys Choir in New York City. She will perform chamber music and solo recitals across the United States and Germany.